Azure-winged Magpies are beautiful birds in the corvid family. 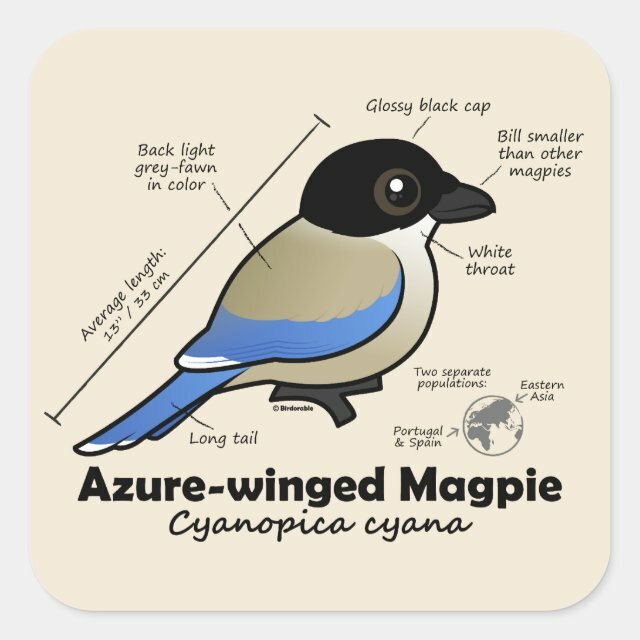 This cute original design features a cartoon Birdorable Azure-winged Magpie along with statistics about the bird's features like measurements, range, and plumage. You can customize this gift! Move the design around, change the background color or style, add text or images -- make it your own! Our square sticker is available in two sizes: 1.5 inch (20 per sheet) or 3 inches (6 per sheet). These stickers are great for labeling your stuff, scrapbooking, sealing envelopes or just plain fun. They are easy to peel-and-stick anywhere and have vibrant colors printed on scratch-resistant paper!